So far in August 2018, noctilucent clouds are being reported to Spaceweather.com four times as often as during the same period in 2017. What’s happening up there? It might be the solar cycle at work. Previous studies have shown that NLCs sometimes intensify during solar minimum. During solar minimum, the sun’s extreme UV output decreases. This has two effects: (1) the upper atmosphere cools and (2) the upper atmosphere keeps more of its water molecules, which are normally split apart by UV rays. 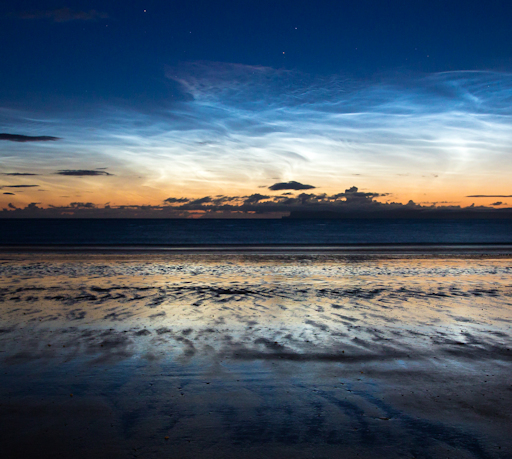 More water + less warmth = more icy noctilucent clouds. If this is indeed what’s happening, more NLCs may be in the offing as solar minimum continues to deepen in August 2018.